the boat, but they caught nothing all night. were so many fish in it. over a charcoal fire, and some bread. 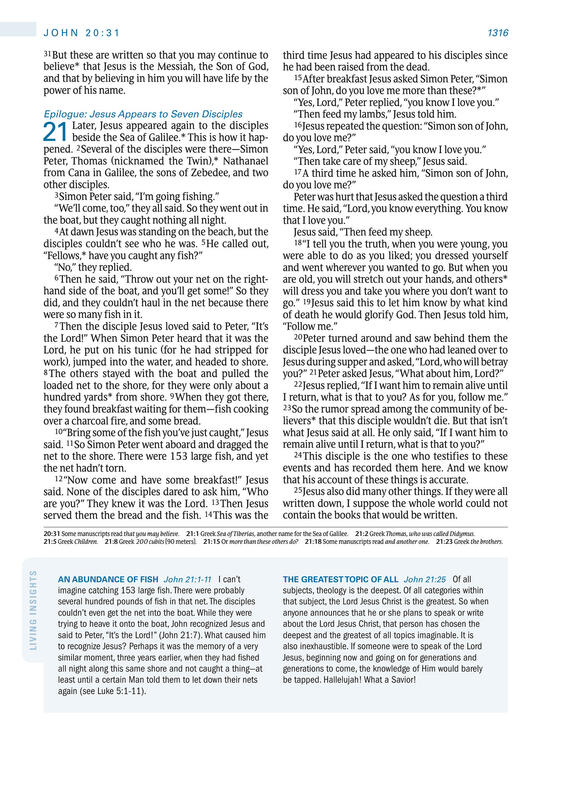 “Then feed my lambs,” ­Jesus told him. “Then take care of my sheep,” ­Jesus said. ­Jesus said, “Then feed my sheep. that his account of these things is accurate. 20:31 Some manuscripts read that you may believe. 21:1 Greek Sea of Tiberias, another name for the Sea of Galilee. 21:2 Greek Thomas, who was called Didymus. 21:5 Greek Children. 21:8 Greek 200 cubits [90 meters]. 21:15 Or more than these others do? 21:18 Some manuscripts read and another one. 21:23 Greek the brothers. be tapped. Hallelujah! What a Savior!